At Prelude Music Classes for Children, we are proud to offer the early childhood music program Music Together. 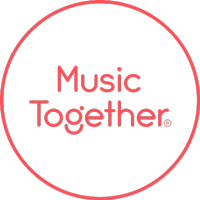 Since 1987, Music Together has introduced millions of children, parents, and teachers around the world to the joys of family music-making and the powerful benefits of having music in their lives. Today, classes for children ages birth through grade two are found around the world---including right here in Houston, Sugar Land, and The Woodlands. By enrolling in our children's music program, you'll experience a whole semester of classes led by one of our trained teachers. No matter what music class you take at Prelude Music Classes, you're guaranteed to learn new songs and music activities to inspire you to bring music into your family's everyday life. At Music Together, we know that children learn differently than adults. They learn instinctively and constantly, and teach themselves through imitation and play, through being immersed in their environment, and through interaction with adults and older children. The family-like setting of Music Together classes creates an ideal learning environment. And it's all based in research in early childhood music development. You are your child's most important music teacher rigth now! Young children learn through play and experimentation and by watching and listening to the grownups they love. Setting an example as an enthusiastic participator in music activities is the best thing any parent or caregiver can do to help se a child on the road to a lifelong love of music. Parents don't need to have music skills---they just need a desire to play and have fun with their children! Our teachers are specially trained to create a safe atmosphere so you can happily join in, experiment, or even get silly---and feel closer to your child while doing so. Wiggling, singing, and laughing with your child is so much fun, it's easy to forget how much learning is taking place! Our research-based curriculum not only developms music skills, it nurtures creativity, self-expression, and confidence while also supporting social, emotional, cognitive, and physical development. Becuase these benefits build over time, children enjoy the fullest growth in each of these areas when they participate as consistently as possible up through kindergarten. The Prelude Music Foundation can bring Music Together to your school. We currently teach the curriculum at Ninfa Laurenzo Early Childhood Center, Fonwood Early Childhood Center, KIPP: Zenith, Shearn Elementary, and Casa de Esperanza. Our weekly in-school classes are 30-45 minutes long and taught by Music Together specialists from The Prelude Music Foundation, in cooperation with classroom teachers at your school. The combination of types of activites are research=based, so they support children's developming music skills, even after the activities evolve into creative musical play and a good bit of genuine, silly fun! And students get materials to take home and share with their parents to strengthen the home-school connection. Please explore The Prelude Music Foundation's website if you'd like to learn more about Music Together at your school.